September takes the kids back to school and reminds the Christmas program director to get busy. If you haven’t even chosen a program yet you’re probably hunting desperately to find one that will work for you. 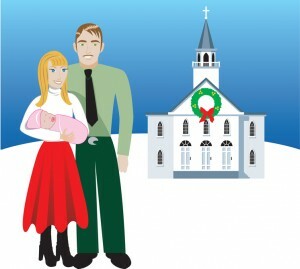 Perhaps you want to have a nice Christmas program, but you have a very small church. What can you do? I’ve worked since 1980 with mission churches. Christmas may be the one time unsaved people will attend and you want to have a meaningful program, but you have so little to work with! Today I’m going to suggest solutions for many of the problems small churches face in finding a Christmas program to suit their needs. Problem: Our kids hate to memorize lines. Solution: Choose a program in which the kids sing songs in groups. Have a helper hold the words for the song. Have the kids read their lines. You can tape the words to the back of a prop or have a helper hold the words written in large letters. This is not as nice as having the words memorized, but if your kids really hate memorization it may be a better answer. Or consider the next answer. Problem: Our teens are too embarrassed to do drama and won’t memorize lines. Solution: Consider puppets. Many teens lose their stage fright behind a puppet stage. We’ve seen many teens enjoy participating on a puppet team who did not want to do regular drama. Kids aged 10-12 who are willing to work hard may do well at puppets too. The smallest of churches can often have an effective puppet team. In New Zealand, puppets are a bit of a novelty, and some of our programs that have been received the best have been those that featured puppets. Here are three of my scripts that work well at Christmas: Could Be Worse; Good News, Bad News, and Christmas Tree Puppet Show. Problem: Our church is not strong in music or drama. How can I make our program shine? Solution: Use unusual musical instruments that are easy to learn. A glockenspiel or xylophone adds a bell-like quality to a simple song. An autoharp or similar stringed instrument is great for a contemplative piece like “What Child is This?” An average musician could teach themselves to play one of these instruments in a few minutes. Young children can easily be taught to play a triangle, shake a shaker, beat a toy drum, or ring jingle bells. My program Sounds of Christmas uses rhythm instruments . Another solution: Use a program that has few memorized lines, but dress the kids in interesting costumes. The kids will be so happy wearing a cool costume that they will often be unaware that their part is actually quite small. Problem: I’ve made great costumes for the program, but some of my kids hate them. Solution: Sometimes kids need to just get used to costumes. You need to give them confidence about how good them look in them so they don’t feel silly. Or they may be jealous of a kid who gets to wear a better costume. Occasionally, however, in spite of your best efforts to reassure them, you find real resistance. As much as possible, avoid making kids wear costumes they really hate. You may have designed a great hat for a wise man, but if the performer really hates it, it may spoil the whole program for him. If younger kids really resist wearing a star shape round their face, have them hold a gold star instead. Take pity on the kid who has been a shepherd or an angel year after year, and give them a different costume this year. If you find strong resistance to costumes, make a mental note to choose a program without them next year. Costumes should be fun and kids need to enjoy being in the program. Make every reasonable effort to ensure this. Problem: Our church is in the middle of a building program and everything is a mess. Solution: Choose a program that fits that. During one mum-daughter nite in New Zealand we used this program, Lives Under Construction. Though this is not a Christmas program, you can see how the theme fits the circumstances. Problem: Our church is going through a difficult time. We have too few people and resources to do most Christmas programs. Names of Jesus has no lines to memorize and requires very minimal practice. It features kids prominently, but requires no costumes, uses extremely simple props, very easy choir numbers, and an easy puppet show. Gifts for Baby Jesus uses five common Christmas costumes, and a few simple props. Five easy parts can be read. Sounds of Christmas uses audience participation and takes no practice. However, you will need to gather some simple rhythm instruments.